Bake and decorate Twitter, Facebook and LinkedIn icon cookies. Prepare adorable Twitter cupcakes – bright blue and featuring the Twitter bird. Like Peeps? They’re sugary marshmallow treats that come in bird form. Get a bunch of blue peeps to represent Twitter. Make your main dessert a cake with an image of your social media avatar (many bakeries can translate a photo image into the frosting). Serve square finger sandwiches painted to look like social media icons (use food paint). Use color contrast to create food displays that have a social media theme. For example, spread blue M&M’s out on a tray, and then use light-colored M&M’s to form an F for Facebook or T for Twitter in the middle of the sea of blue. Make up social media-themed cocktails: a blue Twitter-tini or a red Pinterest drink of some kind (I’m no mixologist – just add food coloring or grenadine, I guess!). Not quite social media – but everyone will love this: Prepare Angry Bird deviled eggs! Download images from the social media sites you use and head to your local print shop. Have them printed into banners and posters. Prinkl makes it easy to print your Instagram photos, either on your own printer or by taking them to a photo printer – hang them up for decorations or print them into little box versions for 3-D table decor. Use Social Print Studio to print stickers of your Instagram photos, and use them to decorate invites, tableware, or to stick on your guests as they enter the party. Create banners featuring interesting, funny, weird, or popular hashtags or tweets. Decorate a wall with blown-up social media avatars of your friends/colleagues, or make a poster-sized collage out of them. Have each guest RSVP with a photo of himself/herself and a short greeting, along with their social media handles. Use these to create banners and posters to hang about the room. 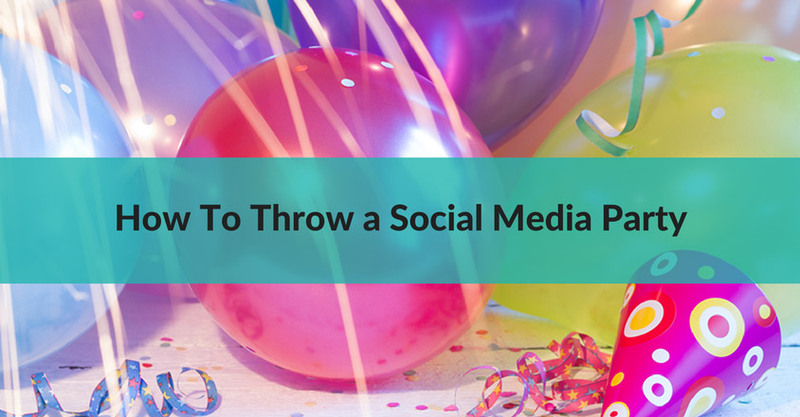 Create social media bunting flags, string them together, and hang them in the party room. 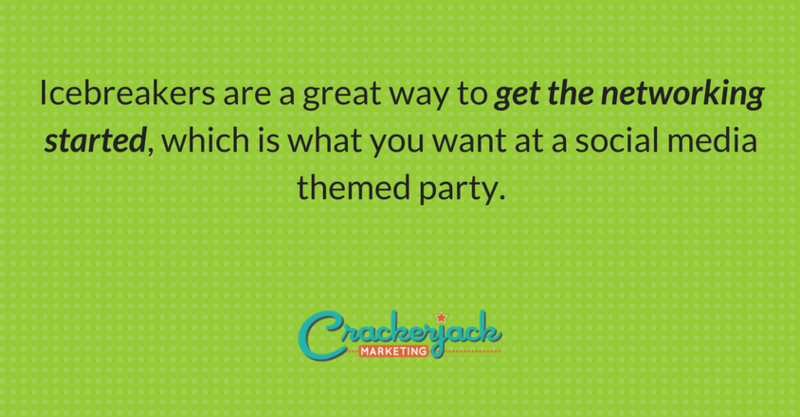 Icebreakers are a great way to get the networking started, which is what you want at a social media themed party. And even more importantly, they can be a whole lot of fun. Here are a few icebreakers and other activities. What’s In a Screen Name (adapted from the “My Name Is” game): Each guest shares his or her screen name for the social media site of your choice and then makes a sentence using each of the letters in the screen name. Bonus points if the sentence is social media related. Know Your Partner (adapted from The Know Thy Neighbor Game): Each guest pairs up with someone new and spends a few minutes talking to him or her. After the allotted time is up, each guest must introduce his or partner, sharing details about the partner, such as his or her name and screen name (for the social media site of your choice), a few of the partner’s likes and dislikes, and a hashtag that describes the partner. Personality Tweets: Have each person write out a 140-character description of his or her personality. Time this activity to make it more difficult and give points for the descriptions that are the most detailed and funny. Tweet Down the Line (adapted from Telephone Game): Form a long line and have the first person make up a tweet. Have each person whisper the tweet to the next person in line. See how much the tweet has changed by the time you get to the end of the line. 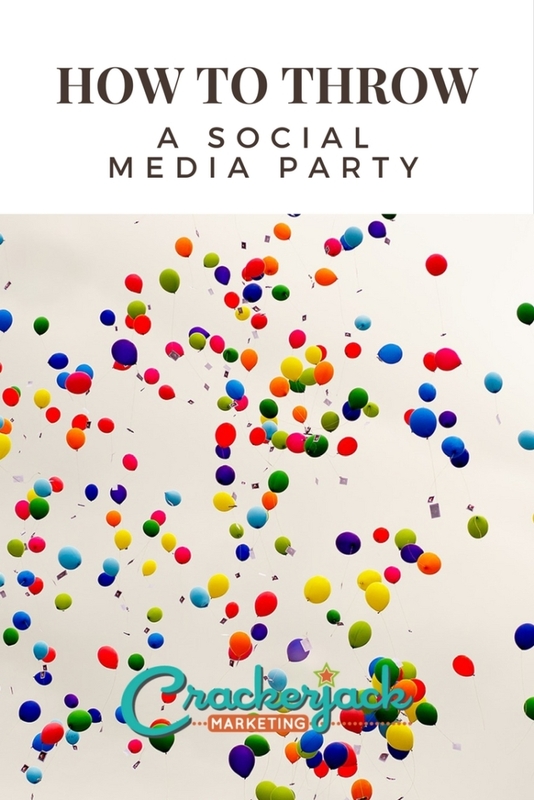 Have you ever thrown an social media party? If so, please tell us in the comments what you ate, how you decorated, and what you did at the party. I’d love to add your images to my Pinterest board, too!